After DVDs, and subsequently Blu-rays, became popular for home entertainment, the studios quickly came to the realization that it’s possible to sell the same movie to their customers repeatedly. The amount of space on these discs permits a previously impossible amount of extra material included. In many instances, the supplements are hardly worthwhile. Something marked ‘unrated’ might only have view minutes or even seconds different from the original theatrical release. In these cases only the most diehard fans, with an excess of disposable income, but even considering repurchasing these additions. Then, there are new releases typically marked ‘Collector’s Edition’ or even ‘Ultimate Edition,' promising a complete consideration of the contained movies feasible. Many times this is just hyperbole, but occasionally a set is released that is remarkable and well worth the investment even if you already own the necessary material contains. 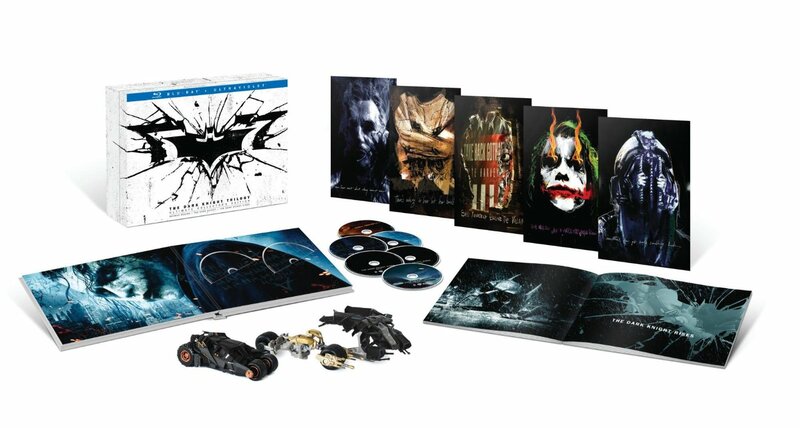 One of the best examples of this to come along in the last few years is ‘The Dark Knight Trilogy Ultimate Collector's Edition.' First and foremost the three movies contained in the set, ‘Batman Begins, The Dark Knight, and The Dark Knight Rises,' are considered the greatest incarnation of Gotham city’s caped crusader ever brought to the screen. The trilogy directed by Christopher Nolan hope to set a new standard for films derived from comic books ready not only succeeds in the action/adventure category but they are considered as truly significant achievements in cinema. For a substantial number of decades, it has been a rivalry between the two major publishers of comic books, DC and Marvel. The franchise constructed by Marvel as set records for box office receipts and consistently gone is the highest praise from the critical community. On the DC side, the efforts to bring their superheroes and villains of the screen have met with lamentably mixed reviews. The one exception that brightens the day of loyal fans is the brand of the three Batman movies contained in this set. The typical inducement to convince serious collectors to reinvest includes one or more of the following bonuses; reedited or expanded versions of the movies, supplemental content such as commentaries, behind the scenes featurette’s an in-depth consideration of various aspects of the production often including stunts, costumes, and set design. Also, there are frequently collectible items such as miniature posters informative booklets or sale models/figurines. Except for the alternate versions theatrical films, this set has all of the above makings it highly desirable for the discerning enthusiast or any cinephile anxious to enhance the understanding of every aspect of the story possible. Normally it would be a serious decision anyone to assess the price tag of about $100 MSRP, but considering your release date was a few years ago is now possible to get the set for less than half of that price. For many years the character of Batman has been a staple of the DC comic lineup within the context of the comic books that man has represented everything from light children’s entertainment to some seriously dark mature content. An entire generation grew up influenced by the 1960s television comedy Batman and his sidekick Robin portrayed an exceptionally camp portrayal that established some exceptionally silly memes. After the attempt to revive the franchise in the late 1980s the results had become so ridiculous, incredibly produced and overacted that it appeared that the ruining the franchise forever. Then filmmaker Christopher Nolan came along and returned the greatest detective to a gloomier representation utilizing themes far too mature for the previous versions. The character had always been psychologically troubled and emotionally disturbed, a vigilante one from watching his parents murdered in a street robbery. This film attempted to connect many of the loose ends as to how young man with a trust fund could become a master of martial arts in possession of some of the most advanced technology imaginable. The solution was to have Bruce Wayne (Christian Bale) traveled to the mystical Far East on a journey of self-discovery. There he would come in contact with Ra's Al Ghul (Henri Ducard), head of the League of Shadows, and ancient society wants to keep society on track through the use of chaos. The actual leader of the organization goes into the nom de guerre of race Henri Ducard (Liam Neeson) trained Bruce with the intent to in a document of the society. When Wayne breaks free and returns the Gotham City River the help of his head of technology Lucius Fox (Morgan Freeman) he has access to a significant amount of highly advanced military technology. This film is considered the crown jewel of the trilogy nominated for eight Academy Awards winning five of them including best actor Best Performance by an Actor in a Supporting Role Heath Ledger. His performance as the Joker is as long as you possibly can get his usual over-the-top comic performances that the character had become associated. Mr. Ledger gave a magnificent performance earned him the first ever posthumous Oscar. His interpretation of the Joker was a hard-core psychopath who set fire to $1 million in cash just to make a point. He lived to create chaos for the sole purpose of watching the world burn. His goal in this outing was to reduce Batman to his lowest form, having to break every aspect of his code of conduct and morality. The performance is so amazingly nuanced it can be watched repeatedly and still, away with something new and exciting. It is insanely rare for an actor to win such a major award for movie derived from a comic book but in this instance, no other performance of the year could come close to that delivered by Mr. Ledger. One of the associate themes examined in this film with the possible purpose a vigilante such as Batman with within the city under siege by crime. This is by far one of the most psychologically intricate and emotionally intense renditions of Batman ever created. This movie was the capstone of the trilogy introduced another character contribute to the franchise that had been trivialized and reduce the absurd previous versions, Catwoman (Anne Hathaway). The sultry villainess exuding sensuality had to be dialed back for television, particularly for a series geared towards children. The character was written in a fashion closer to the maturely inclined graphic novels depicting Selena Kyle as a master thief and intelligence and resourcefulness there was a match for Batman himself. The story also delves into a personal relationship between the two and how it complicated as usual roles in the Gotham underworld. Typical of a movie trilogy the special effects were excited with each successive film. This film had some of the most dramatic special effects including a very intense sequential detonation of a football field. Part of the master either Christopher Nolan demonstrates throughout the trilogy is that he uses special effects as a tool for his storytelling, never as a replacement for a central narrative. As a child, a young Bruce Wayne witnesses the death of his parents at the hands of a crazed criminal. As an adult, Bruce travels the world seeking the means to fight injustice. He lives among the boroughs of offenders and thieves in central Asia. Eventually, he meets a mysterious figure named Rah's Al Guhl and joins his gang called the League of Shadows. Using his training, he can defeat his trainer. Finally meeting up with his estate caretaker Alfred Pennyworth, Bruce Wayne returns to Gotham. There, he becomes the new head of Wayne Enterprises. Together with the help of the CEO of the Wayne Enterprises Applied Sciences Division, a man name Lucious Fox, he dons a new persona: Batman. As Batman takes on the criminals and organized crime underworld of Gotham, a sinister new underbelly of the city is exposed, and a new class of criminal is born. Will Batman be the one to stop them all, or does Gotham need a hero with a face? The Fire Rises: The Creation and Impact of The Dark Knight Trilogy: The inside perspective on the fascinating story behind the creation of one of the most celebrated franchises and how it changed the scope of movie making... forever. Full of never-before-seen footage, rare moments, and exclusive interviews with Guillermo Del Toro, Damon Lindelof, Michael Mann, Richard Roeper, Zack Snyder and others. I MAX Sequences: The Dark Knight; The Dark Knight Rises: See your favorite scenes as they were intended in the original IMAX aspect ratio.